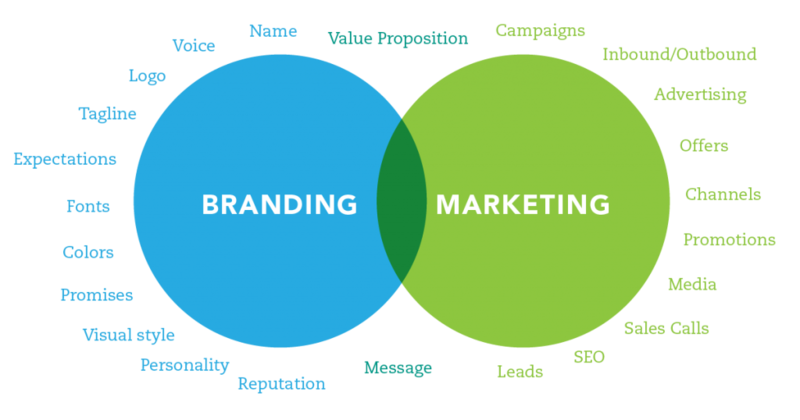 Branding and marketing are related but distinct processes. Let’s start with two definitions. Marketing is about creating a demand for your product or service. Marketing builds people’s interest in buying and encourages people to take action and buy. Branding is the image of your company. Some of your brand is created by you through the way you visually represent your product and service through your colors, fonts, logo, visuals, and physical space. Some of your brand is created by you through your brand’s personality and voice and the customer service you provide. Some of your brand is created in your customers’ mind—what do they expect from you based on how you represent yourself and past experience. This is what it might look like to develop a marketing campaign with poor branding. Imagine creating a series of ads and running them in your local newspaper and on Facebook. But imagine if each ad looked completely different than the others. Your prospects may be interested in your offering, but as they see each ad, rather than building brand recognition in their mind they are actually wondering if there are multiple companies offering similar services. Rather than pushing them to visit your store or buy your product, they are confused and wondering how they will research and decide which brand to choose. It takes as many eight brand touchpoints for prospects to begin to recognize, remember and then act. Your goal is to get in front of your prospects and rack up those tally marks that make your brand feel like a known and trusted entity. If each time they are exposed to your company through your marketing, they see a different brand visual this is not going to be an effective marketing campaign, regardless of details about placement, messaging, audience, etc. Jumping into marketing with poor branding ends up costing you more money and effort. Your marketing will be more effective if you have a clear brand image. On the other hand, branding without marketing will not build your business. Having a well-designed brand image and a website that explains your value proposition using your distinct voice is not enough. That’s a bit like the Field of Dreams, “build it, they will come” philosophy. Wishful thinking but not a good business strategy. Remember, branding is not actively encouraging people to buy your products or service. A consistent brand identity that accurately captures your vision and personality will help your marketing. As explained above, if every marketing activity reinforces your brand recognition, your marketing will be far more powerful. Creating a consistent look and feel for your brand saves you time and angst. Rather than agonizing over design decisions every time you run an ad or design an e-newsletter, using consistent colors, fonts and visuals allows you to create all of these materials much quicker. Stop wasting mental energy trying out different colors and fonts each time, stick with pre-determined choices and then you can focus your attention on the real challenges of marketing—getting your message in front of and understood by the right people. If you understand your brand’s personality or voice, you’ll also know how to write your copy and formulate an offer that entices your prospects. When you see branding as a key foundational element, you’ll save time and energy, and your marketing activities will be more effective. Tip: Branding Compass will make it easier to do your marketing. After you receive your Branding Compass report, select just 1-2 typefaces and one color palette to use in every single marketing material you create, including social media posts, ads, newsletter and definitely your website.